Is your device & data secure even Offline? One of the most sought-after capabilities can become a loophole, if not secured properly. Accessing vital business information on the go has never been safer – with the combination of advanced features and mobile application management capabilities integrated in the app, you have your data under control every step of the way. No need to get external mobile application management and mobile device management tools to secure your data. With Resco Mobile CRM these are incorporated natively within the application. With Device Security, you can see a detailed overview of each device the app is running on, divide them into groups and apply various security rules. Not to mention the possibility to remotely lock & wipe the entire app and more. The data stored locally on the device (for offline functionality and faster performance of the app) is always securely encrypted by default. The encryption is based on an application key, which is randomly generated when the database is created and protected by password. Resco Mobile CRM doesn’t use any middleware software or component. No data is stored (or cached) anywhere except the app’s local storage. This increases the safety as there’s no data stored in any 3rdparty solution which it could leak from. The main security token is the user password, used for authentication with your CRM server. 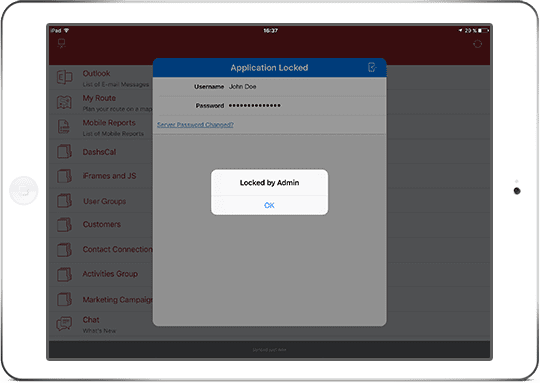 The Resco Mobile CRM can be configured to remember the password once it’s been entered, require the user to enter it every time the app is launched or resumed, or enter the password after specified period of inactivity (e.g. after 30 minutes). Add an extra layer of security with multi-factor authentication. When you sign in to the app with your user name and password, you will need to verify your identity by pairing your device with the LoginTag which encodes a security token to match with your credentials. Utilizing NFC, Bluetooth or QR code scanning. 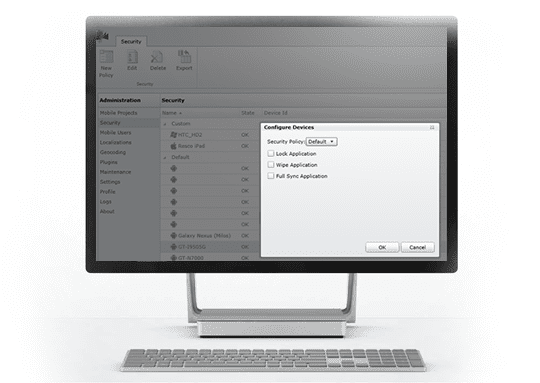 In the app’s configuration tool, you can effortlesly create and assign security roles for your users and also index and manage the devices on which they’re using the app. If you want to make sure employees use only devices approved by you, you can automatically block all new devices. Once you do that, users will not be able to connect to the server via a phone or tablet that has not yet been enabled. Still concerned about the security of your data? No need to worry – not only is the data securely encrypted but you’re in control of what’s happening to it, at all times. Set up access rights, lock the application, or even remotely wipe the data in case you misplace your device. Want to know more about Device Security?